You might think, “Why should we buy this?” There are various options for you – you can go for forts, tree house, or a sandbox area. For every playground – the possibilities are endless. More so for families with large spaces to spare such as big backyards, there’s so much you can do. But there are several perks when you choose the swing, aside from the obvious reason that it’s incredibly fun for kids and those who are young at heart (yes, including me). Physical activities are important not just for adults but also the little ones. It reduces their chance of becoming obese as they grow up. Also, it’s never too early to engage them in any activity that keeps them moving. There’s something entertaining about it that no other plaything can accomplish. I mean, as a grown-up, I still like to play on swings. But seriously, who doesn’t? It brings a lot of childhood memories. So do your children a favour and give them the same happiness you felt as a kid. Do you remember what kind of pretend play you used to do when you were young? Playing in swing sets gives kids the freedom to be themselves and at the same time, allow them to stay imaginative. I used to pretend I was looking at something far whenever I reach the highest peak while swinging. Just think about it, if it makes you feel like a child when you get on a swing, how much more the actual kids? 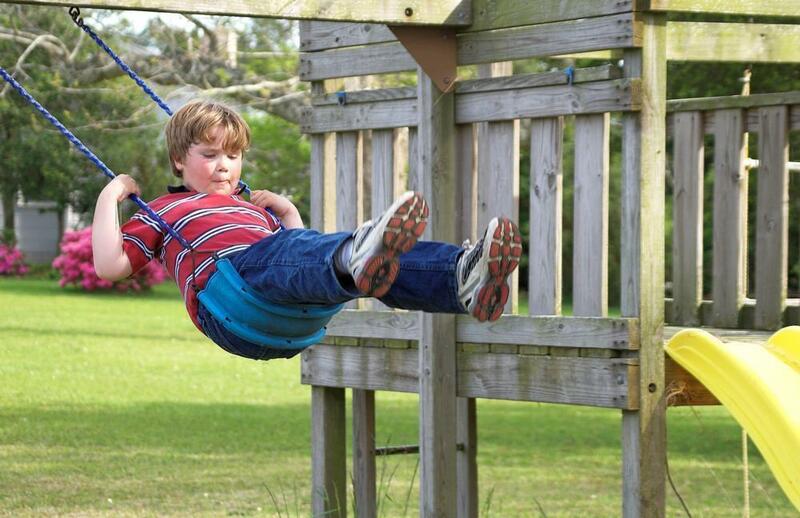 Wherever the swing set is (backyard or park), it immediately becomes a safe place. There’s no pressure to do something that most adults expect of them; they can just be themselves. Nobody judges them because there’s no such thing as the right or wrong way to play. In a nutshell, they blow off the stress and feel so good. This one is pretty obvious. Even those who are so shy when meeting new people will eventually open up. Consider this scenario: one child rides the swing while another one pushes it. That’s instant friendship right there! They can make friends and also learn the value of sharing because they have to let others play on it too. This one has a connection to letting off steam. Sometimes, kids feel pressured at school or even at home. By playing with the swing, they feel a certain sense of freedom and confidence. Always be around to supervise the kids. They should stay within your vision, and it doesn’t matter how old they already are. Sometimes, we might think they can take care of themselves because they’re not toddlers anymore or the swing is in your backyard. Unforeseen circumstances can still happen, and it’s better to be safe than sorry. Buy a set that’s the right height for your kids and the one that’s appropriate for their age. I understand the appeal of buying those they can use a few months or years from now (it's economically practical) but think of their safety which is the top priority. You can upgrade later if they start growing out of it, but it’s never safe to pick those sets which aren’t ‘right’ for their height and age. Set up the swing on a level surface and in a shaded area. These are all to ensure the structure is stable and secure. Your child will ride on it, so it better be. Also, you don’t want to pick a place that’s too sunny because the metal parts might overheat and end up burning your child. Regularly check for anything hazardous like rusting or any broken parts. Your kid might accidentally hit them and suffer injury. Especially when there’s some metal, and it recently rained, assess for any corrosion. Toddlers and older kids are rough when it comes to playing, and their toys always take a beating which is why checking is a must so you can quickly fix it as soon as possible. Ensure the sets are safely apart. This is to avoid any collision when more than one child is playing. Sometimes, they can get too caught up and enjoy way too much they might not notice that their swing is about to collide with another. Tell the kids not to jump off mid-swing. I know we used to do this before, perhaps we’re all guilty of doing it at one point. But it can be dangerous. Instruct them to avoid it but don’t scold them in front of other kids too. It is a grand and luxurious set because it has everything a playhouse needs – clubhouse, two standard belt swings and two-person set glider, sandbox, slide, monkey bars, solid rock climbing wall and a lower play deck. There’s even a picnic table underneath the upper fort. It’s ever kids’ dream set. The recommended age is from 36 months to 10 years old. There are plenty of options and will keep your kids busy. Also, the swing set alone can accommodate children of various ages. 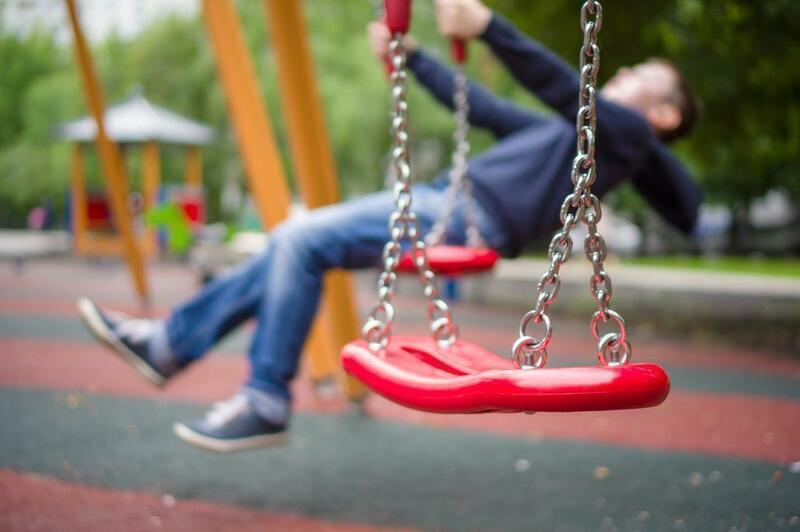 If your child gets bored with riding the swing, you can switch it up by playing together at the clubhouse or helping them up the monkey bars. It has plenty of physical benefits because some parts are challenging such as the rock climbing wall. Nevertheless, it will help develop their coordination and strength. The structure is rot-resistant and durable. It will stand the test of time and can hold up even with kids playing roughly on it. It has heavy duty brackets to keep the parts together. It gives you a peace of mind knowing that it’s sturdy, safe and secure. It’s well-designed, and the features allow the kids to grow into it. It’s not easy putting them together, and it may even require some drilling. It’s not suitable for small yards or spaces. This set boasts of several features including two attached swings and a raised playhouse that has a slide and steering wheel. It’s perfect for any outdoor space and the colors look pleasing to the eyes because they’re vibrant and fun. Overall, this can aid in the development of balance and coordination. It’s suitable for children who are 36 months up to 6 years old. It’s well-engineered and has a sturdy structure. It is of high quality and secured too. Aesthetically, it has a good colour scheme and pleasing to the eyes as well. It’s not too big, so it’s ideal for smaller yards and outdoor spaces. If kids get bored with the swing, they can play with the steering wheel on the playhouse or the slide. You know how children are, they love variety, and when a swing set has additional features, it’s always a huge plus. It’s not as expensive as other sets. No more than four children should play at the same time. It requires setting up on a flat surface, preferably outdoors. It’s difficult to assemble and requires a truck load of patience. The instructions aren’t clear and organised. This simple wooden structure can accommodate children from 3 to 10 years old. It's constructed with durable materials such as the New Zealand Pine. It’s also UV-protected, so it doesn’t fade even when regularly exposed to harsh climates like wind and rain. The steel parts have protection from rust. The maximum weight limit is at 150 pounds. The instructions included are easy to understand and follow. The anchor kit also ensures additional stability. There’s a sufficient distance between the two swings which I appreciate because it can prevent any accidental collision. It’s well-built and can withstand rough playing and handling. It doesn’t take too much time to finish assembling this swing set. It’s stable enough for adults to try. It’s a good way to bond with the kids. The wood used is robust and durable; you don’t have to worry about flimsy structure. The small parts are all smooth, and it doesn’t look like it will easily break apart. You need adequate space in your backyard since the rope is pretty long and your kids might try to go as high as they can. Make sure there are no trees nearby. This set includes two standard-size, heavy duty moulded swings and a rubberized trapeze bar with gym rings. It features an all-weather high-strength low alloy steel which guarantees that the structure won’t peel, crack, rot, chip or even fade like other low-quality products. Because it’s free-standing, it doesn’t need cement during assembly. It also includes a five-year limited warranty. There are no hard edges because they’re either rounded or covered with caps. It’s an additional safety feature to avoid any accidents or injuries. With two-way steel end supports, it ensures durability and stability. The steel poles have passed safety standards, so you know they’re well-made and sturdy. It’s tough enough to accommodate even an adult. It’s virtually maintenance-free and built to last for years even with harsh outdoor climate conditions. It’s a bit cumbersome and difficult to put together because of the bulk. It has basic features and not like the other sets listed here which have slides, climbing walls and even a playhouse. It’s hard to assemble because some parts are tricky and require the help of another person. The swings are tall and the trapeze bar high – it may not be suitable for smaller kids. This set is ideal for children 2 to 10 years of age. The total weight limit is 1050 pounds and up to 10 kids can play at once. The frame is powder coat-painted which helps ensure additional strength. It features a slide, two swings, rocket rider, trapeze swing, see-saw and an air glider. Setting up the whole set may take a few hours, but it’s not that difficult to assemble, although the directions aren’t very clear and easy to follow. Nonetheless, it requires two people to put it up. It can be tedious if you try to do it alone. It’s durable enough to last for years, and the structure is sturdy for multiple kids to play at the same time. 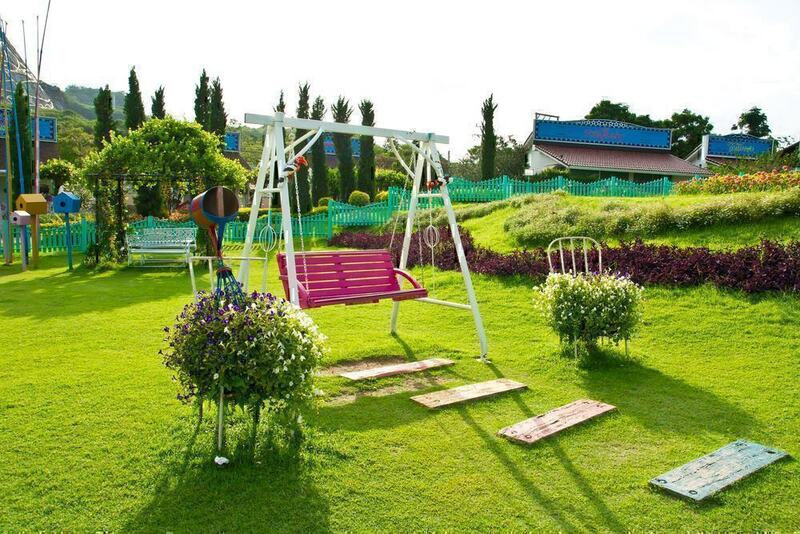 It’s low to the ground, so you won’t get heart attacks each time smaller children ride the swing. There are plastic covers on the chains which avoid pinching fingers. Some parts allow the child to grow into it which is always a good feature. It’s not suitable for backyards with soft surfaces. It should be hard enough to ensure stability. Some screw holes may not line up and require you to re-drill them. Swing sets are so fun to play with family and friends. It’s not just a fantastic physical activity and an excellent way to socialise with other kids, but it leaves your child with plenty of happy memories. 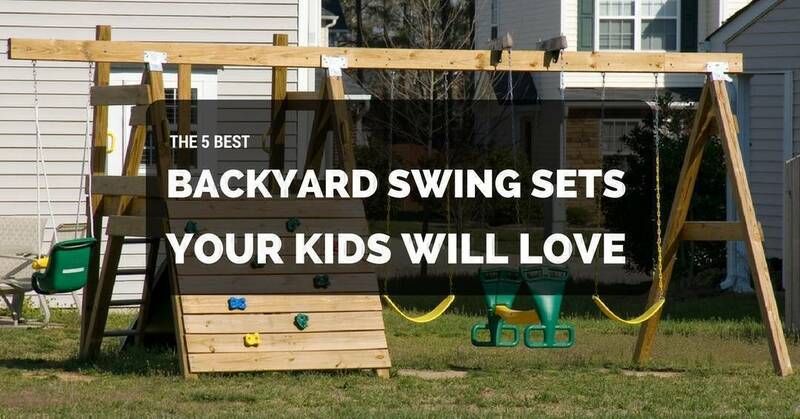 They get to enjoy and also bond with you.Because I like options, my top choice is the Backyard Discovery Skyfort II All Cedar Wood Swing Playset. There are so many things to do, and it guarantees that your kid will never get bored. Besides, they can also invite some of their friends and neighbours over, and it’s a party. Yes, it’s a bit expensive and it’s understandable if it’s way beyond your budget. Still, there are other options here which might suit your preference and needs. Which one do you prefer? Share it with me.